As the Amazon Death Star continues to devour brick and mortar retailers and infiltrate homes of adoring fans from coast to coast, President Trump has taken time from his Trade War threats against China to tweet reminders that he still plans to slow Amazon’s ascendance, calling them a “no tax monopoly”. Similar to China’s unfair trade practice, Trump feels Amazon (AMZN) has a free sales tax ride, hurting American jobs and the Post Office. Never mind that AMZN pays sales tax in every state that requires them and jobless claims are at 45 year lows. As for the Post Office, we all know they have problems of their own making and AMZN has been helping, not hurting the Post Office’s bottom line. The Presidents punishment power is limited in this matter. The Trumpian pattern is to demand penalty flags in order to negotiate a first down. It will be up to the Supreme Court or Congress to inflict any lasting damage, however we suspect the Amazon star will keep rising ever higher once these minor attacks have run their course. In November 2017, the Postal Service reported a fiscal year loss of $2.7 Billion, which is an amazing improvement cutting normal losses in half by simply tampering with the accounting formula for retirement benefits. Congratulations? Since 2007, losses have gone postal with more than $63 Billion wracked up on the taxpayers financial statement. Don’t blame e-commerce! 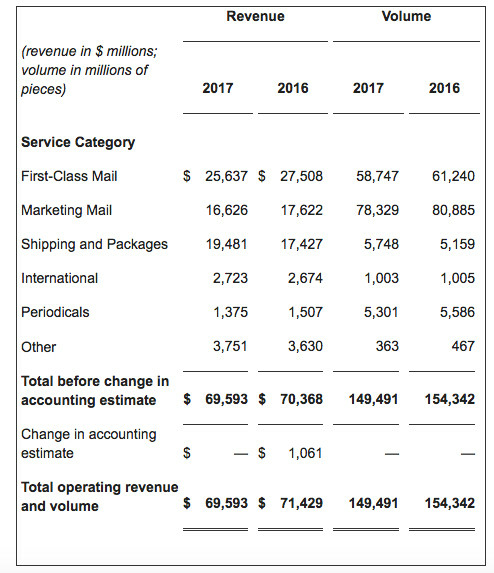 USPS Postal revenue generated from AMZN and online retailers mainly, rose about 12% in 2017 while unprofitable first-class mail contracted 3%. With $178 billion in sales last year, AMZN pays more tax than legally required, but doesn’t collect sales tax on third-party vendors that account for about half of its revenue. State and local governments claim they are missing out on $13 billion annually in sales tax revenues from Internet businesses, including AMZN. Those online businesses follow the 1992 Supreme Court decision indicating that states can’t force a sales tax on businesses that lack a physical presence in a state. Trump’s Justice Department is backing South Dakota v. Wayfair at the Supreme Court to overturn the 1992 ruling allowing e-commerce retailers to avoid sales tax (ruling due in late June). Normally the Supremes would be reluctant to overturn their own ruling, but with Gorsuch the court has shifted adversely to the commerce clause and would seem to favor an internet sales tax. However, AMZN may even gain ground on a negative outcome as they already pay significant taxes and have an enormous leg up on the competition with 100 distribution centers around the US. Worldwide Amazon distribution centers are scheduled to reach 300 in a couple years while employing well over 600,000. 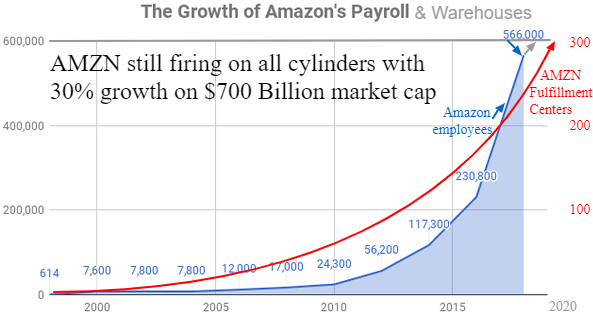 In 2017 alone AMZN created 130,000 jobs, not including the 90,000 usurped in the acquisition of Whole Foods. Walmart is competing fiercely since it last made the top 10 most valuable company list in 2014. Amazon didn’t reach the top 10 list until 2016 and by 2020 it seems likely to surpass Apple for the top spot that Apple has held onto for 6 years straight. With just 4% of domestic retail sales and far less overseas, the untapped potential for e-commerce market share penetration for Amazon remains lucrative for years to come along with a myriad of new growth strategies that have only just begun. With AMZN currently at 1433, we see short term risk target on the current Tech Giant breakdown is 1200 to 1300. Investors should use negative news to accumulate AMZN on its trajectory to be the first Trillion dollar company on the planet by 2020.